It’s a classic, nostalgic scene – relaxing under a bright blue, sun-filled sky, enjoying a gentle crunch that releases sweet refreshment while tantalizing the tongue, juice sneaking down the chin….ahhh, a bite of fresh, chilled, perfectly ripe watermelon. A quintessential summer treat! 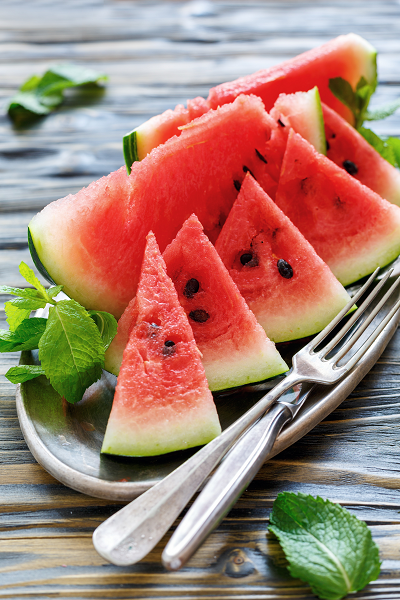 With the July 4th holiday upon us and summer in full swing, it’s a good guess that many may be living some variation of that scene while enjoying a juicy slice of fresh watermelon alongside picnic or bbq fare. Since July is peak season for watermelon harvest, this easy to serve favorite has held a prominent place on summer menus for as long as most can recall. In fact, watermelon’s history dates back to Egyptian times as portrayed in hieroglyphics. Nutritionally, watermelon is recognized as a superfood, which is surprising to many. It contains high levels of key nutrients such as lycopene, Vitamins A, B6 and C, antioxidants and amino acids which are shown to reduce inflammation in the body and reduce the risk of some major diseases. With over 300 varieties grown, it can be fun to seek out lesser known options at local farm stands. Those varieties generally fall under these major categories – the classic, large, seeded melons (sometimes called “picnic”), smaller seedless varieties (“sometimes called “icebox”), mini or personal melons and sweeter yellow or orange-fleshed melons. Watermelons have a shelf life of about 3 – 4 weeks starting from the time of harvest. For this reason, the freshest melons may be found at your local farmers market or farm stand. When purchasing watermelon from the grocery store, take into account the time and distance it had to travel. The best grocery store melons will be well within that 3 to 4-week window. Watermelon can be frozen for up to 6 months for use in beverages, popsicles, ice cream, sorbet or granita, jelly – any item requiring liquefied watermelon. One great thing about watermelon is that it is entirely edible. In addition to the ideas presented above for using frozen watermelon, here are a few ideas for use while it is fresh. Watermelon is most often enjoyed fresh and unadorned as an accompaniment to a meal. It also works well in fruit salads with or without a dressing, or as part of a savory entrée. For an easy, tantalizing salad that can also be transformed into a great summer entree, try this recipe – WATERMELON SALAD with BERRY BALSAMIC POPPY SEED VINAIGRETTE. Most of us only consume the red fruit, yet the rind is equally, if not more, nutritious and can be used in several ways. Here are a few links to recipes using watermelon rinds you may find interesting and delicious. Watermelon seeds, also packed with nutrients, are best consumed once they are sprouted. The sprouting process stimulates the nutrients and also allows for better digestion. Sprouted seeds make great high-protein, low-calorie snacks, and are great for topping off salads, smoothies or desserts. Finally, as a general food safety reminder, the FDA recommends that all fruits and vegetables be thoroughly washed in clean, running water before eating, even those with rinds or peels. When not washed before cutting, dirt and bacteria transferred to the inner fruit by the knife can cause food poisoning. Speaking of knives, it is also important to use clean knives and cutting surfaces, as well as clean hands, prior to preparing any foods.